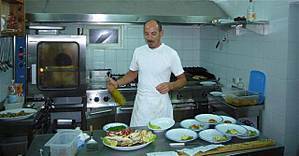 La Nicchia is the most famous restaurant of the island of Pantelleria. Sting’s been here, to eat ravioli stuffed with ricotta under the shade of the orange tree on the terrace. So have Giorgio Armani, Riccardo Muti and Carole Bouquet, the French actress who owns a vineyard here. Anyone who is anyone makes it up the hill to have dinner here at some point, although there are moments when I really don’t know why they bother. La Nicchia is one of those restaurants that doesn’t so much rest on its laurels as roll about inside a giant haystack of them, while kicking its little restaurant legs in the air. Situated high on a hill on the road to Scauri, it is the kind of place that treats non-regulars with a disdain bordering on unkindness, while extracting as much money out of their pockets as possible. S was charged 30 euros for his small John Dory on our last visit; an outrage from which my boy has yet to recover. At least they cooked it nicely, which is about the most I can say about them through clenched teeth. The winds on Pantelleria are so wild that orange and almond trees are grown inside circular stone walls for protection. La Nicchia has turned the orangerie of this former house into its main dining terrace; a walled spaced open to the skies, with little electric lights that swing on wires slung overhead and an alcove featuring a colourful vase by the famous local potter, DiSimone. 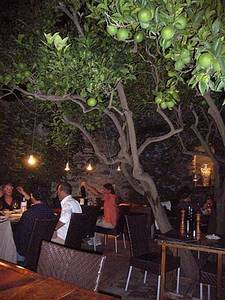 About nine tables are grouped around a plump orange tree, each laid with green napkins, chargers adorned with greasy thumbprints, wine and water glasses, and simple cutlery. We are given an unalluring table by the door. ‘I wonder if this is where Sting sat?’ says S. However, it is a charming room, although some of the appeal is diluted by a waiter and waitress who ply their trade between the tables with glum despondency. Also, I don’t mean to be rude, but both have personal hygiene issues that the management needs to address, pronto. The pair of them shuffle past again, a savoury blast of hard working humanity on a balmy summer night. To begin, we have excellent tuna bresaola; lovely, soft pink slices, served simply with lemon. This fish has been salt cured and air dried, which gives it a haunting flavour. Tuna is plentiful in the surrounding seas, and this treatment of it seems to encapsulate something of the sunny and rich marine flavours of the southern Mediterranean. Not so the Nicchia house speciality, which is raw marinated prawns. This is a terrible idea, badly executed. The prawn carcasses (six) are served with great ceremony on a plate the size of a car tyre, but with their central digestive tracts still attached. It’s not often a dish manages to be disgusting and pointless at the same time, but this one certainly does. As is the custom on the island, pasta is served in gargantuan portions, great cartwheels of spaghetti sprinkled with breadcrumbs or the much loved pesto pantesco; a smoky local sauce of tomatoes, garlic, basil and peppers which is used to dress everything, from pasta to lobster. We have spaghetti with cuttlefish and pallid ravioli stuffed with cow’s milk ricotta and mint; both fine. The best dish of the evening, perhaps even of the year, is a delicious whole sea bream cooked to perfection in the restaurant’s wood-fired pizza oven. It is fabulous, charred to a salty crispness on the outside and succulent within. Puddings are grim; cannoli that taste as if they have been industrially produced and a lame semi-freddo. On a return visit, we are disappointed to learn that Nicchia only fire up the pizza oven at weekends, but are grateful that they’ve gone to the effort of turning the light bulb on above our table. Another restaurant on the island only does that when you sit down, but I admire that kind of energy saving thrift. Here, we eat a gloomy, overpriced meal in the ground floor dining room where every mouthful is watched by the two owners, who sit at a desk in the middle of the room like exam invigilators or police interrogators. What do they think is going to happen? Someone is going to run of with the half a euro that rolled under the radiator two years ago? Or one of the waiting staff is going to bolt to the bathroom and crack open a bar of soap? It’s so depressing, like eating in the dining room of HMP Ristorante. I never want to go back to Nicchia again, even if their wafer thin pizzas, draped with pale pink ribbons of ham, looked divine. Thank goodness then for La Favarotta, our favourite restaurant on the island, a place that will restore your faith in Italy and in humanity. 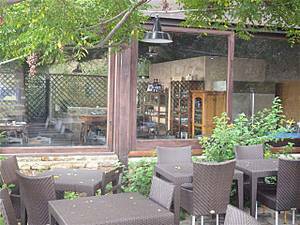 Open only in the evenings, it’s quite hard to reach, situated at the end of a long and winding single-track road edged with wild fennel and little vineyards. Yet there is a briskness about La Favarotta; a keenness to feed, and feed well, that seems to have been lost in the mists of hospitality. Situated on top of a hill in the middle of the rolling countryside, this pink-walled restaurant in far-flung Pantelleria is like a traveller’s inn from a bygone age. Jugs of local wine are brought to the table as soon as you arrive, as are plates of simple antipasti that showcase the produce of the island; fat, dark olives, pungent capers, a hunk of cheese and some thin-skinned tomatoes so full of fragrance and flavour that they could make the unwary weep. After this, there is a choice of three pasta dishes, three main courses and a few desserts for a flat charge of 25 euros per person, including wine. Everything is fresh and good; carefully cooked and assured of its own integrity. The standout dish is wild rabbit roasted with olives, served with its own kidneys and liver tucked back inside the carcass. Moist and flavourful, it is not the kind of thing you see on menus often, not in the UK at least. ‘That’s because it’s so hard to do properly,’ says S.
Puddings are a creamy semi-freddo zig-zagged with a viscous chocolate sauce and rusk-like biscuits baked with sesame seeds and served with a glass of passito, the lovely local dessert wine. The owners of Nicchia would do well to come here, to this cheerful, unpretentious restaurant, sit down and have a meal, and learn something about the art of hospitality and sending customers home happy into the dark and fragrant night. La Favarotta is our favarotta; highly recommended. La Nicchia, C. da Scauri, Salita San Gaetano 11, Pantelleria, Italy. 11. Tel: 00 39 09 23 916 342. Dinner for two, excluding wine, £85. La Favarotta, Localita Khamma Fuori, 91017 Pantelleria, Italy. Tel: 00 39 09 23 915 347. Dinner for two, including wine, £35.